On November 19th, 1986, a raiding party consisting of 27 New York City police officers and detectives converged on an apartment building in the Morrisania section of the Bronx. Their target was Larry Davis, a supposedly violent criminal laying low in his sister’s apartment. Davis was wanted for questioning in regards to the murders of four suspected drug dealers. Shortly after the nine-man raiding party entered the domicile, a violent gun battle ensued. Davis, armed with a 16-gauge sawed-off shotgun and a .45 caliber semi-automatic pistol, wounded six officers before making his escape. He then evaded capture for 17 days, ultimately surrendering to authorities after holding a family hostage. Davis maintained that the NYPD was out to get him because of his intimate knowledge of their corrupt practices, and that the raid was actually an assassination attempt. Miraculously, he was acquitted of all charges except for weapons possession. However, he was ultimately charged and convicted of yet another murder. On February 20th, 2008, while serving out a sentence of 25 years to life at Shawangunk prison, Davis was stabbed to death by another inmate. Though the story described above may sound like something out of a spaghetti western or a 1940's gangster film, it did indeed happen. Since entering the public consciousness nearly 27 years ago, Larry Davis has remained a polarizing figure. Some see him as a hero. Others see him as merely a violent crook that finally got his long overdue comeuppance in a prison yard. In spite of such controversy, one thing remains clear: The story of Larry Davis is surely a compelling one. Now, Epoch Motion Pictures attempts to shed some light on the man and his legacy, with The Larry Davis Project (The Life & Death Of A Bronx Rebel). The Larry Davis Project isn't the first of its kind. Troy Reed attempted something similar about a decade ago, as part of his Street Stars DVD series. That notable effort notwithstanding, Epoch Motion Pictures seems to be offering much more in the way of context. This is evidenced by the film’s trailer. Pictures, news footage, and the like are interspersed with clips from classic Hip-Hop films and documentaries from the exact same era. Attentive and knowledgeable viewers will note brief glimpses of 80 Blocks From Tiffany's, The Deadly Art of Survival, Wild Style, and Beat Street. The filmmaker’s sympathies clearly lie with Davis, as is shown by the film’s title as well as the use of the song “Police State” by Dead Prez. 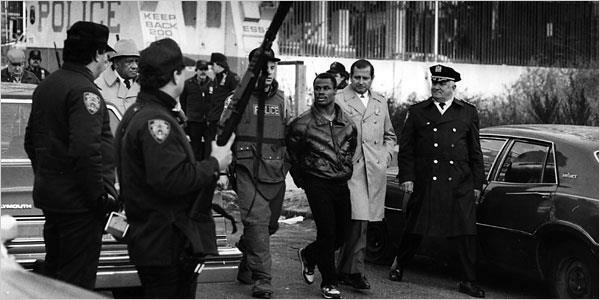 27 years later, the story of Larry Davis and his stand-off with the NYPD is still as relevant as ever. As relations between police and people of color continue to worsen, it’s important to examine just what lies at the heart of such issues. The line between violent criminal and violent revolutionary is often very blurry. Was Larry a predatory force in his community, or was he simply a misunderstood rebel who chose to fight back? Hopefully, The Larry Davis Project will offer some much needed clarity. I love this video! If you want to watch paper help video you can search for it. I admire Larry Davis Project from the college age.